The quote above from the protagonist - Dantala - of Born On A Tuesday summarises my experience reading the book. The moment I opened the novel, I knew I would not put it down until I finished. From the first paragraph, Born On A Tuesday commands your attention and draws you in; your only desire becomes to find out how the story ends. Just like that initial piece of sugarcane, the book creates a longing that demands immediate satisfaction. 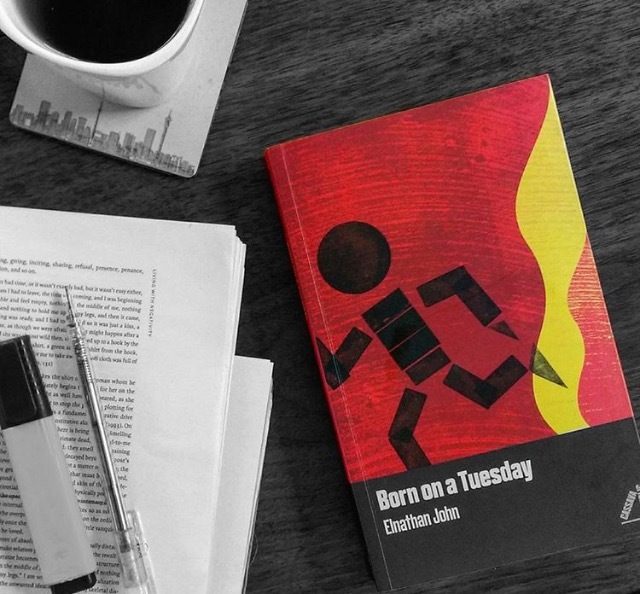 In Born On A Tuesday, the author, Elnathan John, explores the intricate web of religious fundamentalism, political conflicts and the complex sorites paradox of human morality. Amidst all these, there is a story of love, both platonic and romantic; there is loss, grief, friendship, violence and tragedy. ‘Dantala’ - a Hausa name for a male child born on a Tuesday, and the protagonist - is sent to Bayan Layi, Kaduna from a small village in Sokoto, to study the Quran under Mallam Junaidu as an almajiri - a Muslim scholar. Through Dantala, John tells the story of a young boy growing up in politically tumultuous and conservative Northern Nigeria; navigating the terrains of adolescence against the backdrop of religious extremism, intra-religious and sectoral tensions between Sunni and Shia Muslims. In his time under scholarship, Dantala is constantly found questioning the binary opposition between good and bad taught to him his whole life. On completing Quranic education, he joins a group of street boys who sleep under the ‘Kuka’ (baobab) tree, as he cannot afford the transportation fee to return to Sokoto. Dantala’s fate shortly after, to some extent, aligns with the common critiques of the system of almajiri - a term which now wears derogatory face. The almajiri culture, today, unfortunately sees children (scholars) being neglected under- and after- the care of their Mallams, and thus, forced into the streets to beg, in attempt to fend for themselves. As such, they become vulnerable and exposed to danger and abuse, and potential recruits for political wars and terrorism. In Dantala's case, he and his friends are recruited as political thugs to burn down the headquarters and houses of an opposition party. Predictably, this results in violence, and the police gets involved. Dantala is forced to literally run for his life, and he flees home to Sokoto. As he arrives in Sokoto, sick from an accident, he is immediately taken in by Sheikh Jamal - the head of the local mosque. The Sheikh takes him under his wing, gives him a room and a job in the Mosque. Sheikh Jamal is described as a deeply pious, kind and intelligent man. Mallam Abdul-Nur’s message and following grows stronger and bolder, eventually breaking away from the Sheikh and taking his followers to a nearby village to form his own Caliphate. Somewhere in the mix, Jibril - Mallam Abdul Nur’s younger brother - becomes best friends with Dantala; teaching him English and introducing him to girls. Through Jubril, Dantala gets updates on the new Caliphate which is basically a camp of torture and agony — sharing similarities with the rise of Muhammadu Marwa, popularly known as Maitatsine in the 1970s. Maitatsine preached according to a puritanical interpretation of the Quran, promoting Islamic fundamentalism and extremism. He was a preacher who claimed to be a prophet, and amassed a huge following known as Yan Tatsine. Due to their violence-inducing narratives, there were often clashes between his followers and the authorities. Mallam Abdul-Nur’s character in Born On A Tuesday, though fictional, can be found in parallel to the evolution of Maitatsine and Muhammad Yusuf - the founder of Boko Haram. A prevalent theme which was well explored by the author was the moral extremes of the characters’ actions and complex nature of human beings. The reader sees this through the Sheikh’s persistence in keeping Mallam Abdul-Nur in the Mosque despite his extremist teachings, and in the initial kindness shown to him by Abdul-Nur in earlier years. Even in stories of infidelity - though not justifying the act - one learns that, sometimes, good men do bad things, and this does not necessarily make any less of a good person. This is also reflected in the case of Shuaibu and Dantala, in relation to Khadija, and Dantala’s relationship with his brothers - who were sent to study under a different Mallam in Maiduguri, under Shia Islam. Given that Dantala is Sunni - a sect with differing beliefs to Shia Islam - this causes rifts between them. When Dantala and his brothers reunite, they can barely have a conversation, and an attempt at one results in a bitter argument. They are unable to accept each other, and this is further aggravated by the Sunni-Shia conflict — one that dates back to the Prophet Muhammad’s (SWT) death. This conflict, still raging today in Nigeria and across the Muslim world, continues to gain new political dimension, and has resulted in the death and prosecution of thousands. When one of these fights breaks out in the novel, in Sokoto, Maccido - one of Dantala’s brothers - is shot. Dantala, however, chooses humanity over all else. He goes to the hospital to visit Maccido, despite their differences. Elnathan John shows an image of a family caught between sect rivalries and importantly, highlights the consequences of such conflicts on a micro level. As a Northern woman myself, I am always aware of how the Northern woman is represented - be it in writing, film, or other platforms. The North, in itself, is an enigma, and the Northern woman, even more so. The identity of the Northern woman, perceived by many and constructed by the media, revolves around certain stereotypes. She is usually depicted as weak, docile, submissive, timid and only spoken about in the context of marriage or being a victim. Summarily: the Northern woman is seen to have no agency or voice. I had hoped that Born On A Tuesday would oppose these constructs. Unfortunately, the major female characters in the book could be traced in similar light of the ‘Northern Woman’ stereotype. Umma, Dantala’s mother, is described from the beginning as a woman of few words. After she loses her twin daughters - Husseina and Hassana - in a flood, she is completely mute and eventually bedridden. Even when Dantala returns home after years of being away, Umma does not talk to him. She simply smiles and walks away. Khadija, on the hand, is abandoned by her husband - Shuaibu - for not spending enough time with him during Umma’s illness. He then marries a younger wife, and lives with her in a hut a few minutes from Khadija. Here, we meet yet another mute and voiceless female. The danger in these characterisations is that they fix and naturalise the above stereotype. Seemingly, Aisha - the Sheikh’s young daughter with whom Dantala fell in love with - on the other hand, is a breath of fresh air. She is shown as bold and having more of a voice. Aisha, however, ends up getting married to Alhaji Usman - the rich politician who was a supporter of the Sheikh and a sponsor of the Mosque. This, once again, reinforces the a stereotype about Northern women having no agency, and depending on the rich man to save them. Despite Aisha being involved with Dantala, she marries the Alhaji who is much older and wealthier. This echoes the need for more literature on the North with stronger and more diverse female characters — the fact of the matter is that these women do exist in real life. I was initially disappointed as I had found nor learnt nothing new. Upon being reflexive, however, I realise that this may be due to the fact I am from the North, and have lived most of my life in the region. Perhaps, Born On A Tuesday, as shown in our twitter conversation here, may be a more insightful read to a reader who is not familiar with Northern Nigeria, and is able to contrast the culture and the practice of Islam. Reflecting further, perhaps, the main take away of the story is that life is more grey than black and white — that is, sometimes, victims can be perpetrators, and perpetrators can be victims. Above all, Elnathan John maps out the futile conditions that give rise to insurgencies. Incontestable remains his ability to humanise both the victims and perpetrators of such conditions. Through Dantala's experience, the largely perceived image of Northern part of Nigeria as monolithic is deconstructed. Have you read Born On A Tuesday? How did you find it? Share with us below or via social media. If you haven't, you can purchase a copy from us. Simply send us an email.